New version 3.0 of AllNetic Working Time Tracker is available! New beta version 3.0 of AllNetic Working Time Tracker is available! 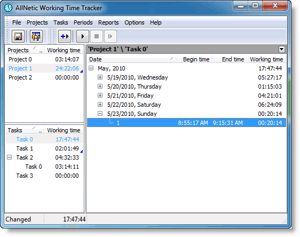 Thanks to precise time tracking and accounting you can quickly and precisely calculate time spent on different tasks. You can bill your clients based on real reports. You can plan your working day better and be more effective in managing your time as you see, where your time is gone. And of course, you get more free time by organizing it more efficiently. Designed for Windows® 7 / Vista / XP / 2008 / 2003 / 2000.